Around one month back, this blog featured a poll that asked you which window manager (Desktop) you used the most. The poll was open roughly for two weeks and closed on 31st of August 2007. In those two weeks, nearly 900 (889 votes) people voted in the polls. And the results are not entirely out of expectation. 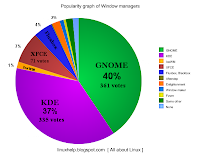 GNOME and KDE are neck and neck in the popularity front with GNOME being the favoured window manager by 361 people vs KDE by 335 people. Now it can be stated with certainty that both these window managers (desktops really) are equally popular since the difference is just less than 30 votes. The third place goes to XFCE which is also not a big surprise and it snagged 71 votes (around 7% of the total votes cast). Fluxbox/Blackbox combination takes the 4th place. What is really surprising is that Enlightenment received 18 votes which is more than what IceWM got. Now, I have not seen that many Linux distributions or Unices which come pre-loaded with Enlightenment window manager, though I have found it a very good one. But many Linux distributions such as the mini ones do bundle IceWM with them. Below are the full results of the polls. You should change the title of the articles to "...GNOME the most popular *desktop environment* ...", as GNOME and KDE are desktop environments, not window managers. You cannot compare, for example, IceWM and GNOME, since the first is a WM and the second is a DE. You should compare IceWM and Metacity, or IceWM and Kwin. I have changed the title and I agree with you, *Desktop environment* suites better than just *desktop* or *window manager*. But there are people who use icewm or fvwm or some other window manager exclusively instead of relying on gnome or kde as a desktop. So I had stated in the beginning of the poll that I was clubbing window managers and desktops into one category for the sake of running the poll. dukebody is right you can not compare cars with engines. I use openbox as window manger in gnome, can i vote twice ? I have a friend who really isn't much into Linux (other than hating MS), who mentioned the eLive distro (see http://www.elivecd.org for more). I also recently saw mention of an Enlightenment-based *buntu project, though I forget the exact name they used. Though of course everyone is still waiting for a final version of E17, just as we're waiting for KDE4 (though KDE4 will be here sooner). This poll is spot on. I use KDE as my desktop of choice. But I have several friends who are also Linux users who favor GNOME. This may be partly because many main stream distributions such as Fedora, Open SuSE, Debian etc which have single CD versions which come (or came) bundled with GNOME as the default desktop environment. Perhaps this might change when KDE 4.0 makes its debut in December this year. If you use openbox as the window manager and GNOME running on top of it you vote for GNOME and not openbox. This is because this poll asks which desktop environment you use the most and does not refer to window manager in its purest terms. For example the poll does not list pure window managers like kwm, gwm, mwm and so on.